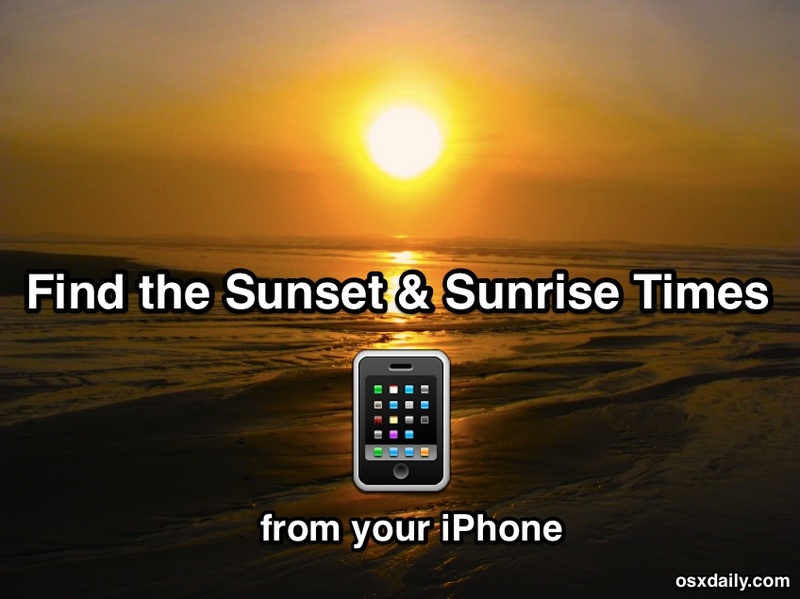 You can quickly get the Sunrise and Sunset times on a given day for any location, right from your iPhone or iPad. So whether you’re planning a romantic rendezvous for sunset, just want to see the sun peak over the horizon, gearing up for some dramatic lighting photography, or you’re aiming for dawn patrol waves or untracked powder at sunrise, you can quickly determine when you’ll need to be heading to your preferred spot to have the best experience. 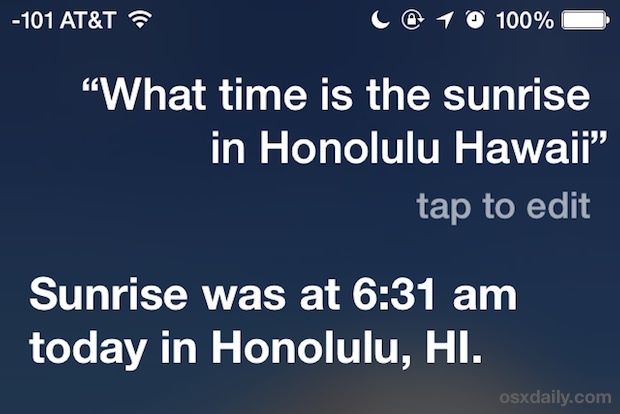 The iPhone actually offers two options to retrieve sunset and sunrise data, either from Siri or from the bundled Weather app, while the iPad is limited to the latter option through Siri. 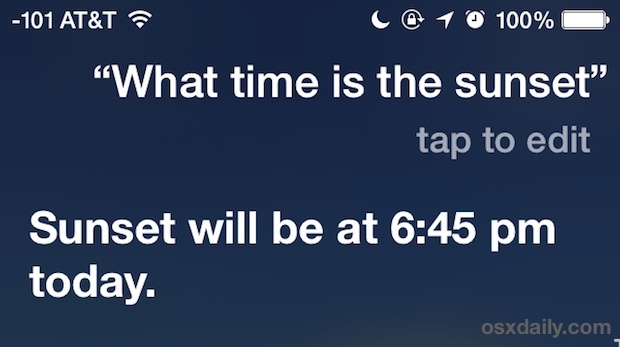 Siri is probably the easier option to use anyway, so we’ll focus on that first. So what are you waiting for? Hit the waves or be a romantic… let’s get the time of the sunset! This will offer the given time for the current day. 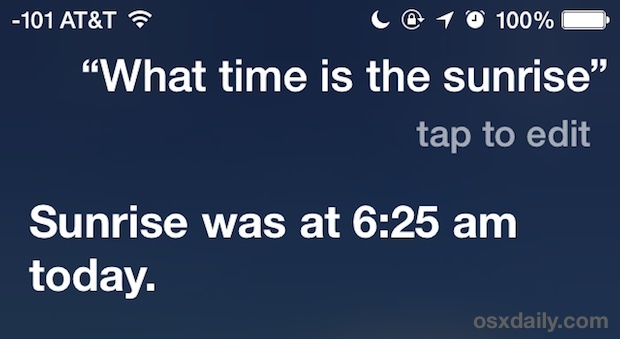 At the moment, Siri isn’t too great at forecasting ahead, so if you’re trying to find the sunset time 6 months out you’ll usually get a “I don’t know, but today it’s at…” response, or if you phrase it differently, you may see a solar calendar appear through WolframAlpha. This means you’ll want to keep your focus on the near term, which is usually appropriate anyway. 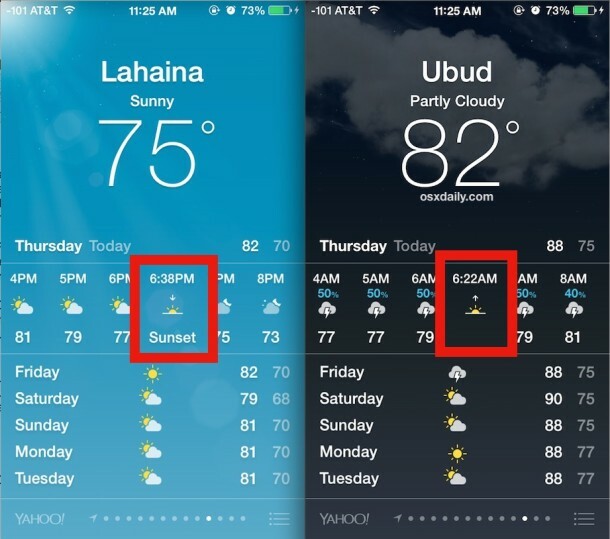 The iPhone includes the native Weather app, offering the forecast along with specifics like humidity, wind speed, and the chance of rain, but less known is the hour-by-hour forecast scrollbar also includes the times for sunrise and sunset. To see the sunset time, scroll horizontally in either a forward or backward motion on the hour forecast, again depending on the current time of day. Similar to the Sunrise label, sometimes “Sunset” isn’t visible but will instead display an icon of a sun dipping under a horizon. For the photographers and romantics, you’re probably good to go with just the basic sunset and sunrise times, so plan accordingly. Keep in mind your season if you’re forecasting out a day or two or an event or experience. For the athletic users who are interested in getting the sunrise and sunset times for their given sports activities, you may find that additional details like humidity, wind speed, bulb temperature, and chance of rain are also worthwhile to check out, as well as getting barometric pressure and the dew point from Siri. Have fun out there and enjoy the moment, whatever you’re doing!